Core Deco is a geometric sans-serif typeface created by Hyun-Seung together with Dae-Hoon Hahm and Min-Joo Ham and published by S-Core that has various styles but two styles stand out: one – thin and elegant; two – stong contrast. This Art Deco Font family comes with a lot of Open type Features, Latin, Central European, Turkish character sets, but also support for style alternative features. It is perfect for artworks, display, headline, invitation, magazine, logo, poster etc. I’m sure you’ll need it! 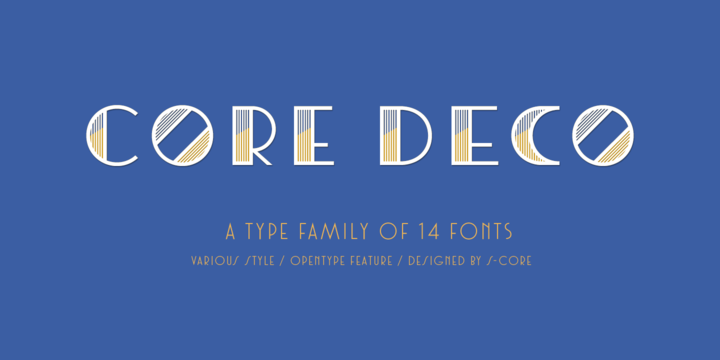 A font description published on Friday, March 28th, 2014 in Fonts, S-Core by Alexandra that has 6,743 views.